Pandora Recovery enables you to recover accidentally deleted files from NTFS, FAT16 and FAT32 formatted drives or memory cards, even if they have been emptied from the recycle bin. The program offers a quick scan for recently... Offers to install promotional, third party software. MjM Photo Recovery will recover images that have been deleted from a memory card, or from memory cards that have been formatted. The easy-to-use interface will automatically detect the media card in the card reader and scan... Offers to install promotional, third party software. 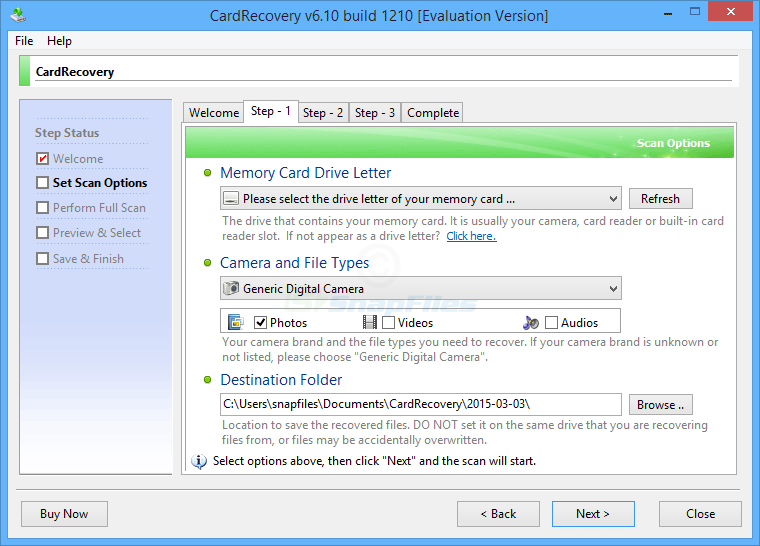 PC Inspector File Recovery is a data recovery program with support for FAT 12/16/32 and NTFS file systems. It recovers files with the original time and date stamp, even when a header entry is no longer available. On FAT... Offers to install promotional, third party software. Restoration is an easy to use and straight forward tool to undelete files that were removed from the recycle bin or directly deleted from within Windows. Upon start, you can scan for all files that may be recovered and also... Offers to install promotional, third party software.